Paper Wrapped Cake is a literal translation of one of my favorite mid afternoon (sometimes breakfast) Chinese snacks. In Cantonese it’s called a Zhee-Ba0-Dan-Go, and usually found in many Chinese bakeries. I still can’t really pinpoint what it is exactly, which made my google search for a recipe that much more difficult. It’s not a sponge cake, and it isn’t a chiffon cake either. It’s almost like a cross between the two. 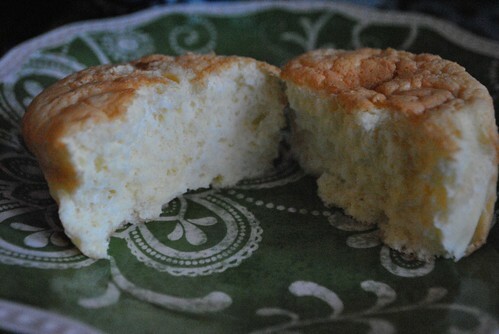 A denser, more substantial chiffon cake, with a more eggy feel to it. Never the less, the local Asian supermarket by me used to sell them in their bakery and they were huge. They used to be really good, until recently when they have become a bit dry on the outside and undercooked on the insides. Sigh, what is a girl to do to fulfill her cravings for such a treat? Make my own of course! 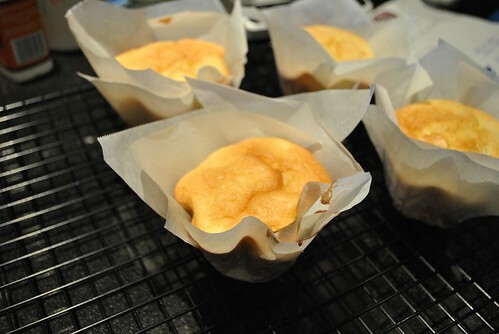 As I had mentioned before, after quite a bit of google searching, and going through quite a few oddball recipes, I came across a recipe for Cake Wrapped in Paper (Hong Kong Cupcakes). Bingo. 7 common ingredients and nothing unusual in the directions meant a very replicable recipe. The only odd piece of equipment used were the tin molds for the cakes. There weren’t typically found in my local Bed Bath and Beyond. 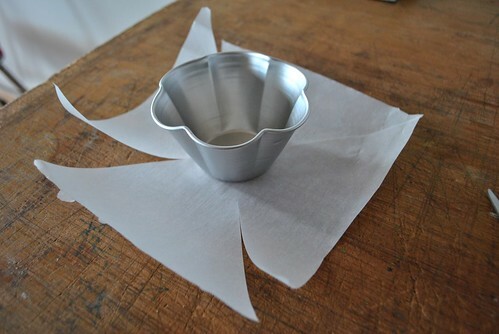 I could use a muffin tin, but I felt that they were too shallow to make a true Paper wrapped cake. Luckily, my mom found some in a store in Flushing, NY and bought me four. The recipe says it makes 6 cakes, so on top of the four tins, I also used two 7 0z ramekins just to see if they would work in lieu of the tins. The writer of the recipe is located in Australia, where the metric system rules. Another reason why you should own a food scale (really…$40 investment with many many returns). I converted some of this to more familiar units of measurement, but they are not exact. I’d recommend using a food scale. Prepare the cups. Like I said, I used 4 tin molds and two 7 oz ramekins. I used parchment paper and cut out squarish pieces for each. 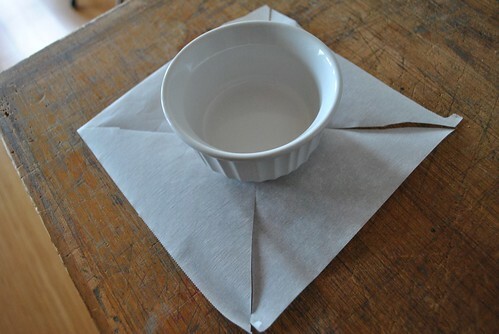 Then I placed each cup in the center and cut from the corners to the bottoms of the cups. Then placed it into the cups and let the pieces work their way around the cup. 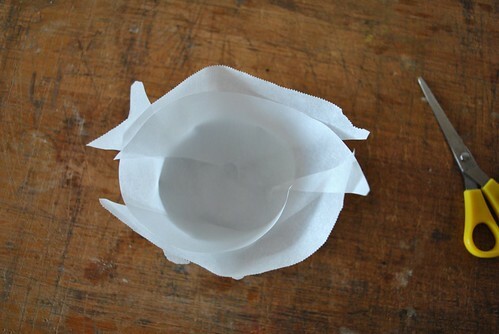 Tear, coax, fold as much as you need to get the paper to line the cups. 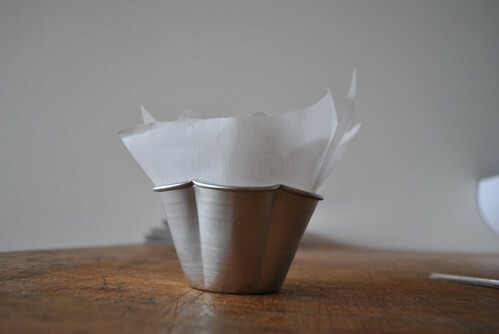 If the paper sticks too much out of the cup, just trim the edges until about a couple of inches above the lip. Don’t go crazy, it just needs to line the cup and then some. 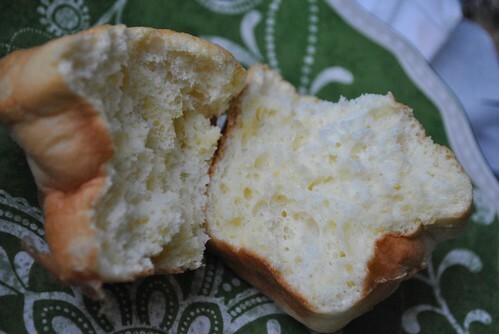 In a bowl, mix together melted butter, milk and “sifted” cake flour. I just broke up clumps with my hands and dumped it into the bowl. 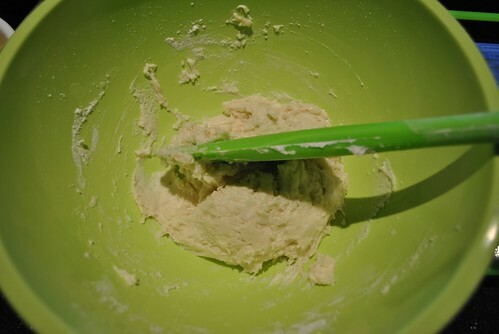 Mix until smooth (but not too much, it is flour after all). 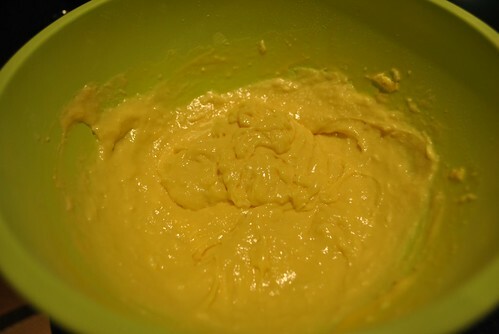 Whisk together the egg yolks and vanilla and add into the flour mixture. Whisk the mixture together till smooth (but again, don’t go overboard). 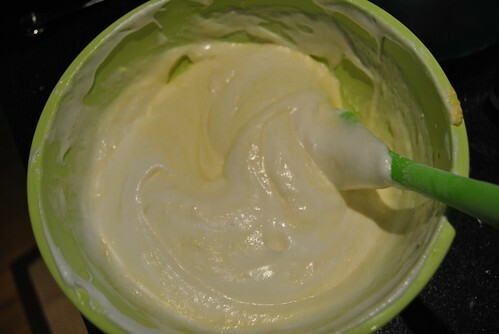 With an electric mixer, or stand mixer with the whisk attachment, beat the egg whites. Once they get foamy, add in the cream of tartar. Once it starts looking more creamy, start adding the sugar in gradually. Beat until stiff peaks form. Be patient and wait for the stiff peaks. One way I like to test it is, stop the beater, and dip the whisk or beater into the mix and pull out and flip upside down. If the peak stays, it’s done. If it looks mushy and is still blobbling (it’s a word) a bit, it needs more beating. 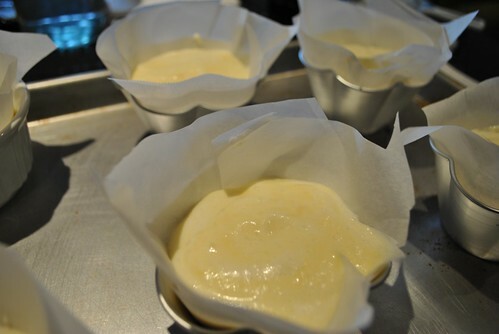 Very gently fold the egg whites into the flour mixture. I did mine in three batches. There can be streaks left. 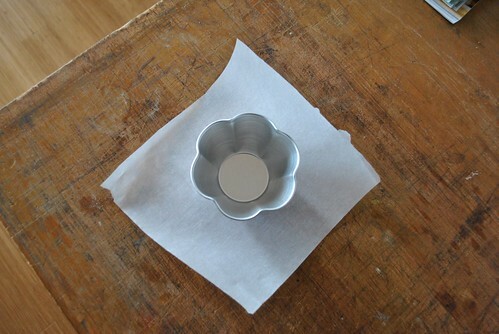 I used a ladle and ladled the mixture into the prepared cups placed on a sheet. Start with one ladle per cup and repeat. Into the oven for about 30 minutes. They are done when a toothpick comes out clean, and the tops are a golden brown color. 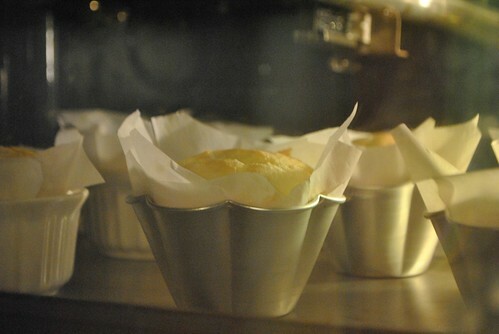 Once out of the oven, let them rest for 2 minutes and then take them out of the cups and let them continue cooling on a wire rack. 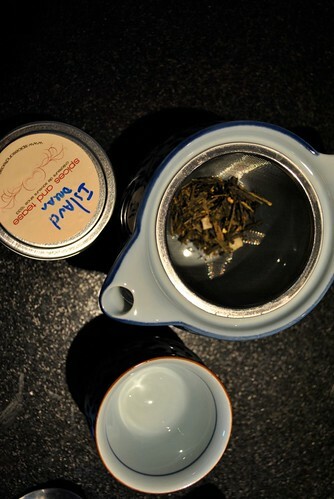 I enjoyed mine with some Island Dream Green tea which I picked up at the Union Square Holiday Market this past holiday season. The only reason I stopped was because the stand (Spices and Tease) smelled so good. They were selling everything from spices to flavored sugars and tea. The Island Dream is a green tea with pineapple and coconut. It smells as good as it sounds, and I was excited to try it. Final verdict? I am really happy how they turned out. 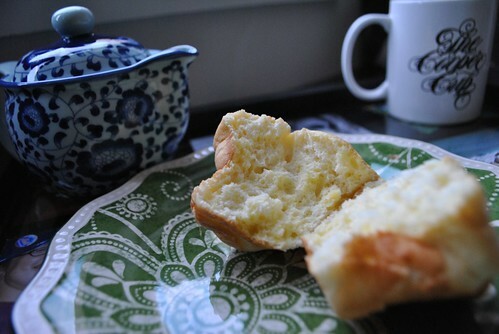 They were fluffy and slightly eggy and went really well with the tea. Very worthy of a 20 minute afternoon break from it all. 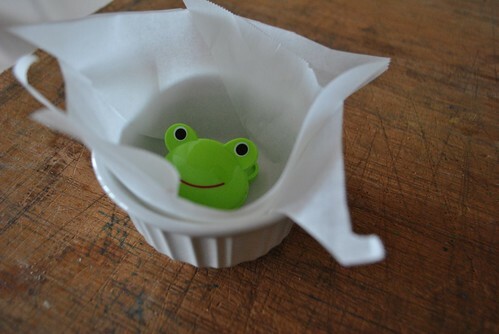 The ramekins really worked out well. Instead of the more traditional shaped cakes, these came out like a mini cake and tasted just the same. So don’t worry about the tins, and just go with the ramekins! 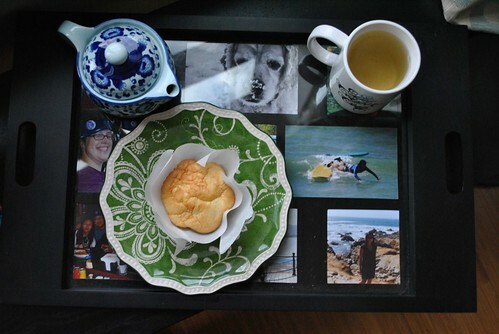 This entry was posted in Cake, Uncategorized and tagged Cake, Chinese, Paper. Bookmark the permalink. Cool!! Loved this blog. Very informative and makes me wanna try it. That’s awesome your mom found you the tins specifically for this. Hi, where in Flushing, NY did you get the tins from? I would love to purchase them to bake these cakes. Thank you in advance! My mom had found them in a restaurant supply store somewhere in Flushing. I’m not really sure where exactly. However, I think (my memory is a bit poor these days) I might have picked up an extra two at the restaurant supply store next to the East Buffet and Restaurant by the intersection of Main Street and Maple Ave. I hope that helps! thank you for replying back to me so quickly! i’ll check it out.